Dallas ISD trustee Miguel Solis. I think they discuss those things. I wasn't actually there. But I am here. Join me. When I got to the Old Monk yesterday around 4:45 p.m., Tim began to cry after dad-rapping five bars about a tax increase, Zac was laughing maniacally, and Dallas ISD Trustee Miguel Solis looked really satisfied with himself. (Eric Celeste was there too, but he does less with this podcast than I do so his only mention will come inside these parentheses.) I had a long interview for a forthcoming feature story—that, in the biz, is what we call a tease—so I missed the whole thing. Solis told me that I “have the power,” because these show notes “determine whether someone listens to it,” which I think ascribes too much responsibility to these words. Or it was a sneaky way to build up my ego to get me to listen before I write this post, and I’m just not going to do that and let him win. Look. This very podcast—EarBurner!—won a national Folio award this week for an episode that had non-traditional show notes. Am I saying this episode will win a national Folio award in a year or so? I’m not saying I’m not saying that. And do you have any evidence that it won’t? Anyway. 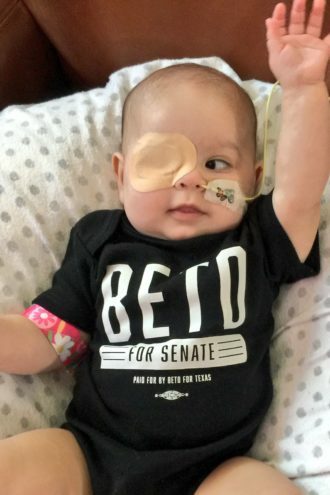 Miguel Solis is a Dallas ISD trustee, husband, and father to young Olivia, who, as you may recall, survived a heart transplant and had a book written about her all before she turned one. She is also very, very cute. 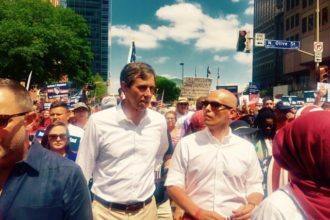 Solis (without hair) speaks to unknown taller gentleman while strolling the streets of downtown Dallas. OK, first thing: Olivia Solis, Miguel’s 7-month-old daughter, is back at home. She got Wilonsky’d earlier this month in The Dallas Morning News. It’s a nice piece that gives you an update on everything that she’s going through to this day—the weekly doctor visits, the blood draws, the therapy, the feeding tube, the meds. It’s also about Olivia’s New Heart, the children’s book that Miguel wrote with his wife Jacqueline Nortman. It was illustrated by Dallas artist Skyler Theriot. Buy a copy here; proceeds benefit Children’s Health, the hospital that treated Olivia. Second thing: Miguel has been on something of a speaking tour alongside Councilman Philip Kingston, proselytizing Dallas ISD to realtors who probably aren’t up on how well the district’s reforms have been working. When you go to the polls between October 22 and November 6—and you will go to the polls, right?—one of the things you’ll be voting for is whether to give the district another $20 a year. (That’s the average. What you pay will be a little different based on your home value.) It’s called a Tax Ratification Election, and that money will go toward expanding the programs that have made the urban school district one of the state’s greatest recent successes, if not the greatest. Some of those programs? The sexiest is probably the Accelerating Campus Excellence model, which gave its best teachers raises to go work at its neediest schools. The result is that a school in Pleasant Grove that was ranked by the state as “Improvement Required” scored higher than Highland Park in math. If you want to know more about the TRE, here are some helpful slides. Young Olivia Solis, wearing a onesie with some sort of Whataburger Spicy Ketchup-inspired design. Third thing: Miguel is from southeast Texas, so he probably shouted out the Astros. The American League Championship Series starts Saturday in Boston. Fourth thing: Tim probably mentioned this Dallas Morning News story about the kickback-taking Councilman Dwaine Caraway receiving a standing ovation at a District 4 debate. Fifth thing: Beto O’Rourke’s polling probably came up, too. A recent poll from Quinnipiac University has him down 9 points. But O’Rourke just raised $38 million in a single quarter, more than any other Senate candidate in history. Texas Monthly asks: could the polls be wrong? 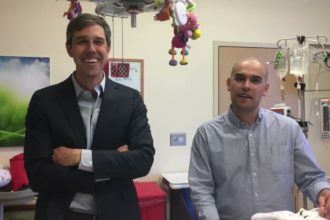 Miguel Solis, right, with that mysterious taller gentleman in his daughter’s hospital room at Children’s. And here’s a gift. I have transcribed Tim’s Dad Rap.